It’s been said that it’s not the cough that carries you off, but the coffin they carry you off in. You might get carried off with today’s Nice Price or Crack Pipe custom Vee-Dub, but will its price still bury its chances? Have you ever spent an inordinate amount of time trying to decipher the meaning of a license plate only to eventually realize that it’s not, in fact, a vanity plate? I was somewhat vexed as I tried to make sense of the 351 UNG plate on yesterday’s sweet 1978 Cadillac Seville Elegante, initially drawn as I was to its being a classic California blue plate. Love those! Few of you loved that classic Caddy’s price however, as the decisive 92-percent Crack Pipe vote made it clear there’s little to no market for Seville survivors in our world. Sad! Cadillac introduced the Seville to attract younger buyers as the audience for which their more traditional products appealed was literally dying out. You needn’t die to ride in this 1970 VW Karmann Ghia-based custom coffin roadster, but those of you who jones over such things may just think you have done so and gone to heaven. Okay, so that’s just two of you. The rest of you will simply have to play a long. I get it, this is a really odd-bodkin of a custom and its mantra could easily be practicality be damned. There is a market for such weird and wonderful specials like this and let’s be honest, who wouldn’t want a casket that also serves as its own hearse? The seller says the car rides on what was once a Ghia platform, but it’s presently all bespoke steel tube between the suspension mounts. The engine is a VW 1600 DP with dual Weber carbs and a Monza exhaust. That all just sits out in the air like it just don’t care, and should you need to make any adjustments to those carbs or perhaps the timing, you could easily do so from the driver’s seat. Wind and weather protection obviously are practically nil, as is instrumentation. But then, this is a nice weather, going to meet-ups and Sunday Brunch-only sort of car. To serve that function it is described as sporting head and brake lights as well as turn signals other than just your left arm. That all supposedly makes it street legal. Check your local laws before purchase to see if owning the car might require you changing states. The casket body is oak with faux handles and a lid that allows access to the five-gallon aluminum fuel tank and your feet. Suspension is your standard Volkswagen torsion bar set up front and rear, while the brakes are discs at each corner. That’s good as you seriously (wood’nt) want to run into anything in this car. Nice slotted wheels—four lug front/five lug rear—stand proudly atop those brakes. Over all the car looks to be in excellent shape and fully realized as a homage to the wacky customs of the Sixties. Is it everybody’s cup of formaldehyde? Obviously, no. In fact, I bet more than half of you can’t even get behind having something of as limited of use as this as a second or third car. The of it thing is; if you go to any Cars and Coffee, or the Early Rodders meet-up that I frequent, you’ll see cars of this grain all the time. Practical? Hell no. Fun for weekend jaunts and jawing with admirers? Damn right. So, as we contemplate its price, let’s take off the practicality hat—and those jorts of logic too—and take a look at this through the eyes of why the eff not? crowd. Are you ready? Okay, here we go. 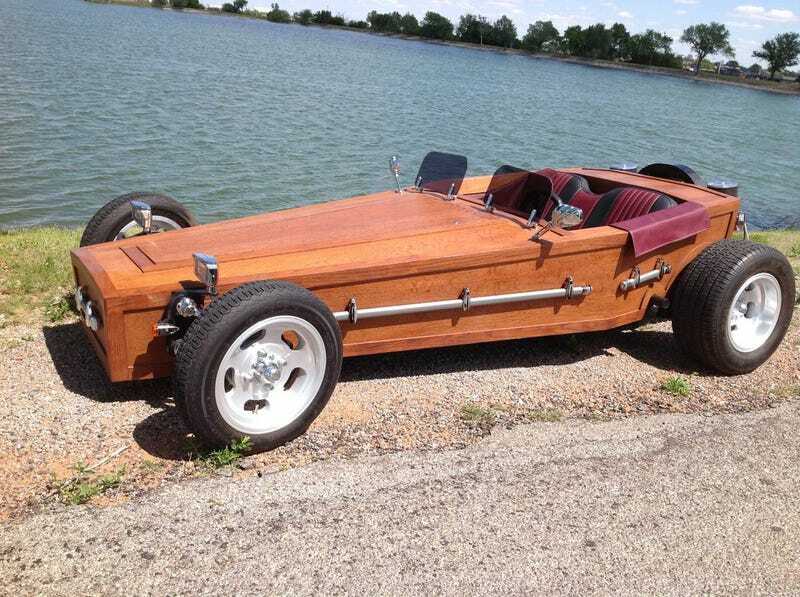 The asking price for this coffin car is $12,000. No, you could not build one for that, I don’t care how many years of wood shop you had in junior high. The question is, should anyone pay that kind of cash for this already built example? Los Angeles CA Craigslist, or go here if the ad disappears. Could This Custom Karmann Ghia Command $18,000?